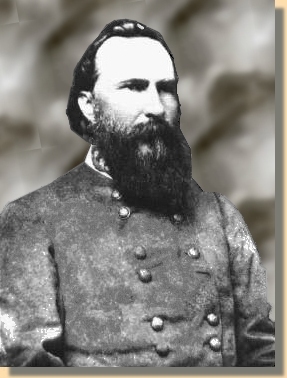 James Longstreet was born in Edgefield, South Carolina on January 8, 1821. His father, also named James, nicknamed him "Pete". His father died when James was twelve. Although he was born in South Carolina, Longstreet considered Georgia his home. He was raised and educated there. Longstreet was appointed to West Point Military Academy from the state of Alabama in 1838, where he met Ulysses S. Grant. After he graduated in 1842, Longstreet was assigned, along with Grant, to the Fourth Infantry at Jefferson Barracks, Missouri. It was there that he introduced his cousin, Julia Dent, to Grant. The two were soon married. After the Mexican war, in which he received a wound to the thigh, Longstreet married Marie Louise Garland, the daughter of one of his former commanders. At the battle of First Manassas, July 1861, Longstreet's troops defended Blackburn's Ford. He was appointed Major General in October, 1861. In early 1862, Longstreet suffered a serious personal loss when three of his children died of scarlet fever during an epidemic in Richmond. The tragedy affected him deeply. Longstreet's Children's Marker at Hollywood Cemetery in Richmond, Va. In April, 1862, commanding a division, Longstreet conducted a rear guard action near Williamsburg during McCellan's approach to Richmond during Peninsula campaign . After Confederate General Johnston's injury, Robert E. Lee took command and formed the Army of Northern Virginia . Longstreet and Lee developed a friendship that lasted until Lee's death in 1870. During the Seven Days battles around Richmond (June 25-July 1, 1862), Longstreet demonstrated his courage and willingness to fight. At the Second Battle of Manassas on August 29-30, 1862 he launched a massive counterattack on the second day of fighting which forced Pope's army to retreat toward Washington. During the Confederate invasion of Maryland in September of 1862 Longstreet's forces came to D. H. Hill's aid at South Mountain and he and his men were heavily involved at the Battle of Sharpsburg (Antietam). Lee recommended Longstreet for a promotion to Lieutenant General on October 11, 1862, and gave him command of the newly formed I Corps . In December, he and his corps played a leading role in Union General Burnside's disastrous repulses on Marye's Heights at Fredericksburg. In early February of 1863, Longstreet was sent to gather and secure supplies in what was to become known as the Suffolk Campaign. Although he gathered a fair amount of the available supplies, and held up the Union forces, he failed to expel the Union from the area. The Battle of Chancellorsville took place before Longstreet and his command could rejoin Lee. Prior to the Battle of Gettysburg, Longstreet offered a plan to the Richmond government designed to relieve pressure on Vicksburg. His plan was not adopted, that June, in favor of Lee's plan to invade the North. Lee's plan was designed to, relieve Virginia of Union troops, giving farmers time to bring in their crops; threaten Northern Cities convincing the Union government that a continued war was useless; and relieve other parts of the Confederacy by causing Union armies in the west to move east. Reacting to the Army of Northern Virginia moving north, the Army of the Potomac moved faster than Lee had expected. The two armies met at Gettysburg. After the results of Second Manassas and Fredericksburg, Longstreet felt that being on the defensive was the best way to fight the enemy. Accordingly, he told Lee that offensive attacks on the Federal position along Cemetery Ridge were doomed to failure. He preferred to flank the Union line and establish a defensive position somewhere between the Army of the Potomac and Washington. He felt that Meade would then be forced to attack a well-established Confederate line with results similar to Fredericksburg. Because Lee rejected his appeal, some writers have concluded that Longstreet did not give full attention to his command and only reluctantly ordered Pickett's charge, as ordered by Lee, on July 3., leaving it up to a Colonel, --- Colonel Alexander, Commander of the Confederate Artillery --- to decide when Longstreet's forces should attack. Click Here to read text.